Image: Screenshot CBC | YouTube. Wildfires ripping through Canada’s western province of British Columbia since the weekend have forced people to flee and companies in the mining and forestry sectors to scale back or suspend operations. 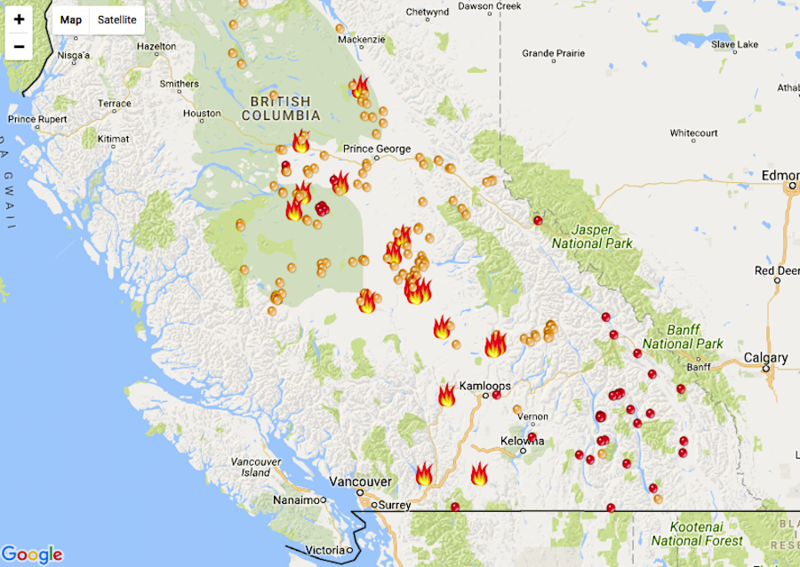 Some of the worst fires, raging in the BC’s interior, have grown overnight, remaining “out of control” and are now threatening Kinder Morgan’s Trans Mountain pipeline. Trans Mountain pipeline, which carries 300,000 barrels a day of crude and refined oil from Alberta to a port in Vancouver for export to the US, goes through the region presently being devastated by the fires. The company told Bloomberg is currently monitoring the area and taking preventative measures to ensure the safety of its operations. This as the pipeline, which carries 300,000 barrels a day of crude and refined oil from Alberta to a port in Vancouver for export to the US, passes through the region presently being devastated by the fires. 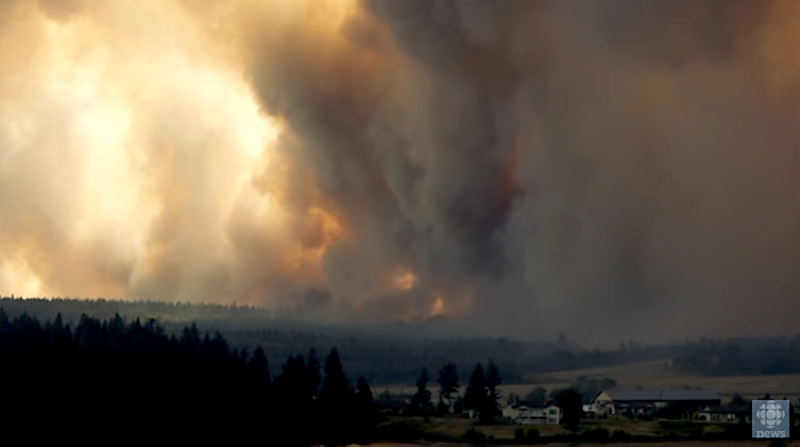 More than 14,000 people are now under evacuation orders as firefighters battle more than 231 wildfires covering 320 square kilometres in the province. The blazes disrupted operations at two mining companies on Monday. Vancouver-based EnGold Mines (TSX-V: EGM) said on Monday it had suspended exploration in BC, where all of its mines are located. Imperial Metals (TSX:III), in turn, said the fires were threatening the homes of many employees who live in the Williams Lake area, and impacting operations at its Mount Polley copper mine. Operations there are "significantly reduced" as some staff members were evacuated from their homes, many roads had been closed and a local airport had been shut down. Environment Canada issued air quality advisories Tuesday for west of Edmonton all the way to the Alberta-B.C. border, including the communities of Hinton, Rocky Mountain House, Whitecourt, Spruce Grove and Jasper National Park. It said that places across the Canada-US border, including Washington and Montana, may also see some smoke drift across the northern part of the two states. FireSmoke Canada’s interactive map shows heavy clouds of smoke moving across central and southern Alberta, into the southern portion of Saskatchewan and the very southwest corner of Manitoba. The B.C. Wildfire Service has developed another useful map. The interactive chart lists all active fires, including (and represented by the large flames) about 17 fires of note that pose a potential threat to public safety. The unfolding events recall last year’s wildfires that swept through Alberta’s Fort McMurray, devastating the area. The blazes forced firms to halt operations and resulted in the loss of $1 billion in planned capital spending for the year in the sector.